Red Roses signify your bonding with your special ones. 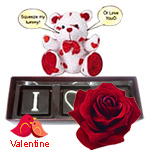 So on this very special day deliver a bouquet of 12 Exclusive Red Dutch Roses along with a small and cute Teddy (6 Inch. ).